The topic of euro breakup has slowly been trickling back in the news, especially with the potential for Italy leaving the currency union, a so-called Italexit. 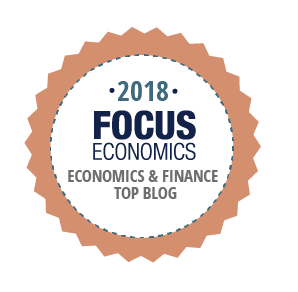 In this post I want to explore one of the major conundrums that would-be exiteers must face; the problem of banknotes. Almost all euro exit scenarios begin with the departing country announcing a shot-gun redenomination of bank deposits into a new currency, in Italy's case the lira. The effort must be sudden—if redenomination is anticipated ahead of time, depositors will preemptively withdraw funds from the exiting country's banking system, say Italy, and put them in the banking systems of the remaining members, say Germany, doing irreparable damage to Italian banks. After all, why risk holding soon-to-be lira when they are likely to be worth far less than euros? Once the surprise redenomination has been carried out, the next step is to quickly introduce new lira banknotes into the economy. Lira deposits, after all, should probably be convertible into lira cash. This is much tougher than it sounds. Consider the recent Indian debacle. On November 8, 2016 Indian PM Narendra Modi demonetized around 85% of India's banknotes. Ever since then the Reserve Bank of India, the nation's central bank, has been furiously trying to replace the legacy issue with new currency. Because a nation's printing presses will typically only have the capacity to augment the stock of already-existing currency by a few percent each year, a rapid replacement of the entire stock simply isn't possible. India, which has been plagued with a chronic shortage of banknotes since the November announcement, is unlikely to meet its citizens' demand for cash until well into 2017. This in turn has hurt the Indian economy. Like India, any Italian effort to print enough new lira paper to meet domestic demand could take months to complete. Without sufficient paper lira, existing euro banknotes would have to meet Italians' demand for paper money. Under this scenario, Italians would have to endure a messy mixture of electronic lira circulating with paper euros, reminiscent of the old bimetallic, or silver & gold standards, of yore. I say messy because everything in Italy would have two prices, a lira price and a euro price. In some ways this would be similar to the euro changeover period in 2002 when European shops displayed both euro and legacy currency prices on their shelves (lira, deutschemarks, francs, etc). The difference is that in the 2002 changeover the exchange rate was fixed, so the amount of mental arithmetic devoted to calculating exchange rates was minimal. In the case of Italexit and a new lira, the price of the lira would likely float relative to the euro, so the mental gymnastics required of Italians would be much more onerous. If the Italian government were to attempt to fix this messiness by forcing retailers to accept euros and lira at a fixed rate, then Gresham's law would probably kick in. Because the government's chosen ratio is likely to overvalue the lira and undervalue the euro, Italians would hoard their paper euros (preferring to use them in Germany and elsewhere) while relying solely on electronic lira to buy things. This hoarding of paper euros, and the ongoing lack of paper lira, would likely lead to a severe banknote shortage, much like the shortages that India and Zimbabwe are currently enduring. Some readers are probably wondering why Italy wouldn't try printing new banknotes ahead of the redenomination date. That way it could engineer a rapid lira changeover rather than a slow one. The problem here is that if Italian authorities take a preemptive approach, odds are that word will leak out that new lira are being printed, and depositors—spotting an impending redenomination coming down the road—will flee the Italian banking system en masse. So we are right back where we started. A successful Italexit requires that new lira banknotes be printed only after the redenomination has been announced, not before. One technique that Italy might try in order to get lira paper into circulation as rapidly as possible is to use overstamping (described here). Once redenomination had been announced, Italian authorities quickly produce a large quantity of special stickers or stamps. They would then require Italians to bring in their euro banknotes to banks in order to be stamped, upon which those overstamped euros would no longer be recognized as euros, but lira. The window for getting euros stamped would last a week or two, after which the Italian government would declare that all remaining euro notes are no longer fit to circulate in Italy. Stamped notes would function as Italy's paper currency until the nation's printing presses have had the time to print genuine lira paper currency, at which point Italians would be required to bring stamped notes in for final conversion. But even here Italy runs into a problem. An Italian with a stash of euro banknotes can either bring this stash in to be overstamped, and eventually converted into lira, or they can break the law and hoard said euros under their mattress. Hoarded euro note will still be valuable because they can be used to buy stuff in Germany, France, and in other remaining eurozone members. An overstamped euro, however, which has effectively been rebranded as lira, will be worth much less than before. Many Italians will therefore avoid getting their money stamped, preferring to get more value for their euro banknotes than less. And this means that Italy is likely to suffer a severe cash crunch, with euros being hoarded and new lira unable to fill the void fast enough, yet another manifestation of Gresham's law. So any would-be euro exiteer faces several ugly possibilities, including a messy period of multiple prices to massive cash crunches. It is because of these difficulties (and others) that I see euro exit as an incredibly unlikely proposition. The euro isn't a glove, it's a Chinese finger trap—once you've got it on, it's almost impossible to get out. If there is to be an exit, the most likely one will be the euros without the Eurozone approach. Rather than announcing a new lira, Italy simply says that it will officially leave the Eurozone while continuing to use the euro unofficially. This means that Italian banks would continue to denominate deposits in euros and keep euro banknotes in reserve to meet redemption requests. The euro would still be used by Italian merchants to price goods, and euro banknotes would continue circulating across the nation. The difference now would be that the Bank of Italy would no longer have the authority to print euro banknotes. Instead, Italy would have to import banknotes from the rest of Europe, much like how Panama—a dollarized nation—imports U.S. banknotes from the U.S., as do Zimbabwe and Ecuador. By employing this sort of strategy, all the hassles I wrote about in this post (multiple prices & cash crunches) are cleanly avoided while at the same time an exit of sorts is achieved. Earlier this month I criticized the architects of India's recent note demonetization for not using the traditional overstamping technique for replacing large quantities of banknotes. This week I want to examine another feature of Modi's demonetization: the concurrent change in note sizing. The new series of ₹500 and ₹2000 notes are smaller in size than the ₹500 and ₹1000 series that they have since replaced. This has caused huge logistical problems. Since each cartridge in an ATM must be manually configured to handle a certain note size, ATMs were not equipped hold the newly issued ₹500s, ₹2000s, or additional ₹100s for that matter. Instead, they were forced to operate at a fraction of their capacity. Indians, desperate to replace their demonetized notes with good cash, were left on the lurch. Let's explore the reduction in banknotes size. I'd argue that independent of the decision to crack down on black money, the decision to go smaller makes a lot of sense. But twinning a banknote size reduction with a demonetization was a recipe for disaster. To Americans and Canadians, this may seem odd since all our money is the same size. However, a pattern of progressively longer notes is quite common in other countries. Euro banknotes, for instance, also increase in size as denomination rises as do Swiss francs and Japanese yen. Presumably this format is chosen to to make manual sorting easier. The trend among central banks is to reduce the dimensions of banknotes. For instance, euro banknotes are quite a bit smaller than the francs, deutschmarks, and other notes that they replaced. The five euro note is one of the smallest notes in the world (see this pdf). When the Swiss began to introduce the ninth generation of Swiss banknotes in 2016, they lopped around 11 mm off the length of the 50 franc note and 4mm off its height (it now clocks in at 70 x 137 mm, down from 74 x 148). By doing so, the Swiss National Bank will be lowering manufacturing and handling costs of the currency. In the chart below, you can see the evolution of the dimensions of Swiss cash over time. So India's decision to reduce the size of the new notes is very much modern practice. 17mm has been removed from the length of the ₹500 note; it measures 150 mm rather than 167mm. As for its height, it has gone from 73mm to 66mm. The new ₹2000 note measures 66mm x166mm, a 20% reduction from what it would have measured had the RBI continued with its old progression. Presumably the RBI will eventually do the same with the smaller denomination like the ₹100 as well. While a note size reduction makes sense, twinning it with an aggressive demonetization was a bad decision. To reduce the odds of damaging the economy, the void left by demonetized notes must be filled as rapidly as possible. In India's case, the discontinuity in banknote size interfered with this re-cashification process. The authorities should have split the two policies apart, say by enacting a gentle two or three-year conversion of existing notes to a new and smaller series, and only announcing a surprise aggressive demonetization of the two highest denomination notes four or five years from now, say in 2021. Alternatively, the authorities could have proceeded with their November 8 aggressive demonetization, but without enacting a note size reduction. The RBI should have taken incoming demonetized 500 and 1000 rupee notes and stamped them for re-circulation to ensure the banknote supply was sufficient, as I went into here. By using existing banknotes, ATMs cartridges would not have required adjustment. As for the new ₹500 note, it should have been the same size as the old series to ensure that cash distribution worked smoothly. Then—say five years from now—the Reserve Bank of India could have gradually phased in reduced note sizes for the entire range of denominations from the ₹10 to the ₹2000. This would have cut down on the chaos of the last few months. The RBI seems not have been involved much in the planning stage of demonetization. According to recent press reports, the Board was "asked" to consider the demonetization just a day before it was enacted and had not discussed the matter before then. This is a shame. While an aggressive demonetization needs to be planned in secret, as I pointed out here, having at least a few closed-mouth central bank types involved from the outset seems like a basic requirement. They might have been able to fix the mistake of combining a demonetization with a note reduction. *On the other hand, there are arguments for increasing note size too. See Garber. If the Fed was so aggressive, why didn't we have inflation? "If the Fed was so aggressive, why didn't we have inflation? And does that mean that Milton Friedman and others were wrong?" It's a good question. Because I find monetary policy confusing, I want to try answering Russ's question with an analogy to an example that doesn't involve money. Say there are two types of gold rings, those with diamonds and those without. The price of gold rings with diamonds exceeds the price of rings without diamonds by a wedge that equals the price of the diamond. A technology emerges that can create diamonds at zero cost. The supply of diamonds will rapidly grow until they become like water; while boasting desirable qualities, a diamond will sell for $0. When this happens the price of gold rings with diamonds will equal the price of gold rings without. Using this analogy, we can understand why—despite having been so aggressive—the Fed didn't create inflation. Treasury debt and Fed debt are alike in that they are both government liabilities. However, Fed debt comes with an extra cherry on top; it can be spent anywhere. Government debt... not so liquid. This mobility is a valuable commodity and people will (typically) pay a premium to own it. So we might say that Treasury debt is very much like our plain gold band, and Fed debt is like a gold band with a diamond attached to it. When the Fed expands aggressively, it does so through open market operations, or by spending its own Fed debt to acquire Treasury debt. What effect do these operations have? Let's look at how open market operations would work in the ring market. A ring producer that has developed a technology to create diamonds at zero cost begins to "spend" new gold bands (with diamonds) into the economy by purchasing gold bands (without diamonds). The number of gold bands in the economy will stay constant (x gold is being swapped for x gold). But the quantity of diamonds in the economy increases. On the margin, diamonds are becoming less valuable, and so the price of gold bands with diamonds falls. We get inflation in the price of gold bands with diamonds. However, this inflation will eventually come to a stop. Once the price of diamonds has fallen to its lower bound of zero, the price of rings with diamonds will equal the price of a rings without. Subsequent spending by our ring producer of new gold bands with diamonds into the economy will have no effect—all that is happening is a swap of a gold band for a gold band, and a swap of like-for- like has no macroeconomic effect. And that's why the Fed's aggressiveness (QEI-III) has had little effect on prices. Once the Fed has conducted enough open market operations, the useful commodity attached to Fed debt that we call mobility—much like the diamond in our previous example—becomes so prevalent that on the margin it is worth zero. At this point, Fed debt loses its uniqueness and is exactly the same as Treasury debt. All subsequent purchases are irrelevant because the Fed is simply switching like-for-like. Thus the Fed, like our ring producer, has lost the ability to create inflation via open market operations. When Indian PM Narendra Modi and his small group of would-be monetary architects were putting together their plan to suddenly demonetize the 500 and 1000 rupee note and replace them with new notes (including a new 2000 rupee note), they must have been missing a monetary historian. That's because there is a long history of nations suddenly demonetizing the entire circulating paper issue and introducing a new paper currency. These rapid switches have tended to follow a well-trodden script, one that Modi did not follow. Had he chosen to adopt it, the last two months might have been less chaotic. One challenge faced by any prospective note switcher is to print the new currency fast enough to replace the legacy notes. When the switch is a slow one that is planned long beforehand, like the euro introduction, this is not an issue. In the case of a rapid switch that cannot be prepared for, however, the printing challenge is overwhelming. In India's case, pre-printing notes was not the answer. Because its goal was to surprise a large number of cash-users with undeclared cash, the rupee switch had to be sudden—printing large batches of notes ahead of time might have tipped off the prey. Without enough currency, however, an economy undergoing a switch is cursed to endure a temporary cash crunch, much like the one India has experienced. To cope with the period between the demonetization of the old notes and the issuance of new ones, nations have resorted to an old monetary trick called overstamping. The 1993 conversion of old Czechoslovak koruna into new Czech and Slovak money is the best modern example of a successful rapid currency switch, thanks in no small part to its use of the overstamping technique. With the January 1993 dissolution of Czechoslovakia into Slovakia and the Czech Republic, the public also anticipated an ensuing breakup of the still-circulating Czechoslovak koruna into two national currencies. Since Czech was expected to be the more economically robust of the two nations, depositors began to move their paper money and bank accounts to the Czech side of the border to ensure their savings would be held in the stronger of the two soon-to-be currencies. Anxious to put an end to capital flight before it crippled the monetary systems of the fledgling nations, the Czechs and Slovaks were forced to introduce new monetary units ahead of schedule. Unfortunately, the banknotes hadn't been printed yet. 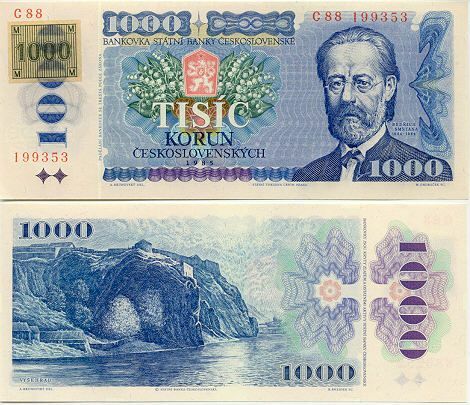 As a temporary expedient, the monetary authorities decided to affix different coloured stickers, or stamps, to existing Czechoslovak banknotes in order to demarcate them as either new Czech koruna or new Slovak koruna. In executing a currency switch, affixing stamps on existing legacy notes has several advantages over relying entirely on new banknotes. Stamps take far less time to design and print than banknotes, they can be rapidly distributed thanks to their small size, and they are cheaper to store. In the case of Czechoslovakia, for six days in February 1993 all koruna banknotes were brought in so as to have the proper Czech or Slovak stamp affixed to them (below is a legacy koruna note with a Czech stamp on it). After the six day period passed, any unstamped currency was declared worthless. Cross border movements of cash between Czech and Slovakia were made illegal for that period and cash withdrawals from banks suspended. Once the new notes had been printed up, Czechs and Slovaks could bring their stamped legacy notes to the bank to get new ones. All in all, it was a relatively smooth currency switch. As I said at the outset, there is a long history to currency swaps. In 1919, the existing Austro-Hungarian krona was dismembered, with each of Czechoslovakia, Serbia, Hungary, Austria, and Romania printing unique stamps to be affixed to the krona circulating in their jurisdiction. Once new notes had been printed, stamped krona could be brought in for redemption. Peter Garber and Michael Spencer go into some detail on this episode here. As for the general practice of affixing stamps to money, I'd suggest Arnold Keller and John Sandrock here. Long lineups developed at banks and, without enough cash to go around, trade has been impaired. Had it borrowed from the above precedents, Modi's demonetization team might have been able to avoid at least some of this mess by procuring a supply of several billion worth of stickers or stamps. Some of these could have been printed and hoarded by the government in the months prior to November 8, the rest could have been printed on demand after the announcement date. The trick would be to ensure that the stamps had enough special security features so that, once issued, they succeeded in throwing off counterfeiters, who would have a strong incentive to make fakes for sale to those who had large amounts of undocumented cash. Under a stamp scheme, come the November 8 demonetization announcement the RBI would have distributed the stamps to banks. Members of the public could then bring their demonetized notes to their local bank in order to have them stamped, up to a certain quota. These stamped notes would quickly reenter circulation, helping close the void left by the sudden demonetization of 80% of India's money supply and the slow trickle of newly-issued 500 and 2000 rupee notes entering the economy. Once the RBI had managed to print enough 500 and 2000 notes, it would set some fixed conversion period for turning in stamped 500 notes and 1000s for new notes. It could be that Modi's team considered a stamping mechanism and decided against it for some justifiable reason that I'm not aware of. Or perhaps they simply didn't do their homework. If they didn't, overstamping could very well have diminished the shock faced by the Indian economy over the last few weeks. Countries that decide to follow India's path in the future would do well to include it in their plans.